What is “Native PZP” ? 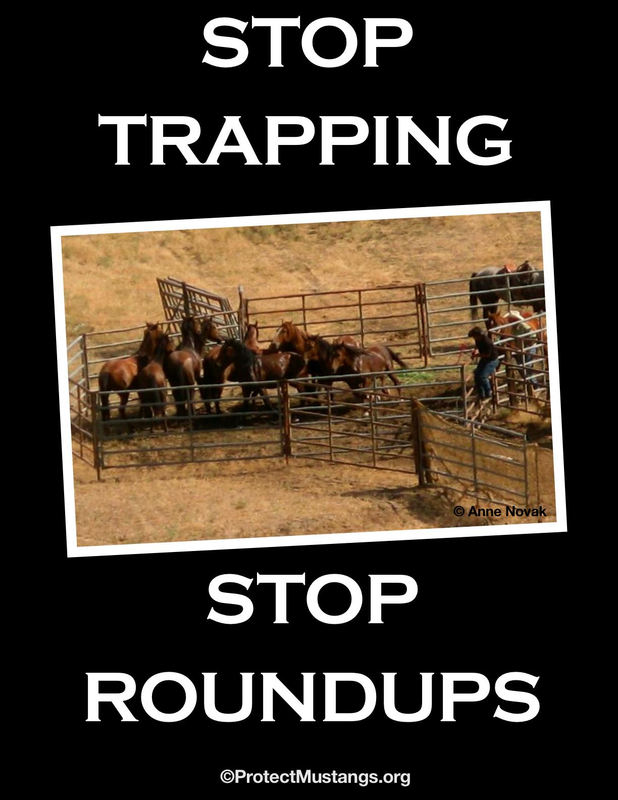 We are against using anything as a pesticide on native wild horses and burros. The EPA passed PZP as a restricted-use pesticide for wild horses and burros in 2012. This gave wild horses and burros the designation of PESTS and must be reversed. We asked Jay Kirkpatrick, Ph.D to define “Native PZP” and this is what he said. The Bureau of Land Management’s (BLM) public workshop on August 6, 2013 in Reno was a pitch session for the agency’s point of view that shade is not necessary at the Palomino Valley Center (PVC). The facility is the largest wild horse and burro short-term holding, adoption and processing center in America. PVC resembles a feedlot–fattening up wild horses before probable slaughter for human consumption. Even so there is no shelter for the close to 2,000 captive wild horses, including pregnant mares and foals, at the huge facility. The workshop was more of a “spin-shop” and failed the BLM’s interactive promise. Often questions from the public were repeated but not answered. The BLM’s neglectful point of view was supported by biased consultants with a history of working for the cattle industry–a long time foe of the wild horse. We received many complaints from members of the public who were in the room, and those on the webinar, stating that their questions and comments were not answered. Advocates were put off after traveling to Reno to give public comment but were not allowed to share their findings because the BLM was not letting them speak. There was no brainstorming session of substance–only a BLM pitch against shade that allowed the concerned public to ask questions and some colorful writing on boards. The advocate community and members of the global public are up in arms that the BLM appears to have found consultants from U.C. Davis who speak with alleged forked tongues to back up the BLM’s negligent care. 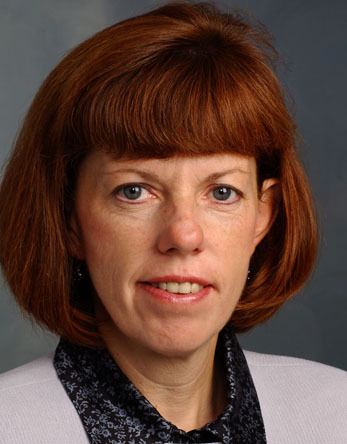 The recommendation by Dr. Carolyn Stull, Ph.D. from U.C. Davis, to deny America’s captive wild horses access to shade/shelter is appalling. Everyone knows the minimum basics of Animal Husbandry 101 is food, shelter, water. Obviously there is a conflict of interest. Is this because of her ties to the cattle industry or is it something else? 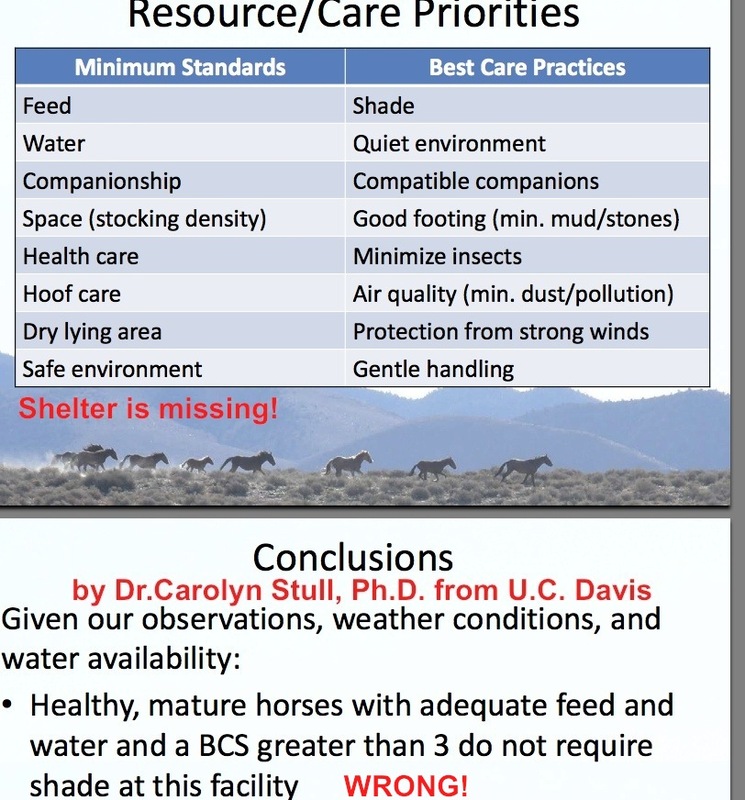 When I asked her why she was recommending no shade/shelter for captive wild horses in the BLM’s care, especially after Stull herself wrote a well known paper on NEGLECT, she appeared to downplay the importance of shade by stating that her paper was for domestic horses in California. Everyone saw through her shocking response. Many advocates have the episode on video and will publish the whole dog and pony show soon. The BLM’s proposition to shade only the “compromised” equids is outrageous. All captive wild horses and burros need access to food, water and shelter. The crowd in the room, the viewers on line, and the public wants all the captive wild horses to have access to shelter. The BLM requires all adopters provide shelter in order to adopt wild horses and burros yet they are not providing it themselves. 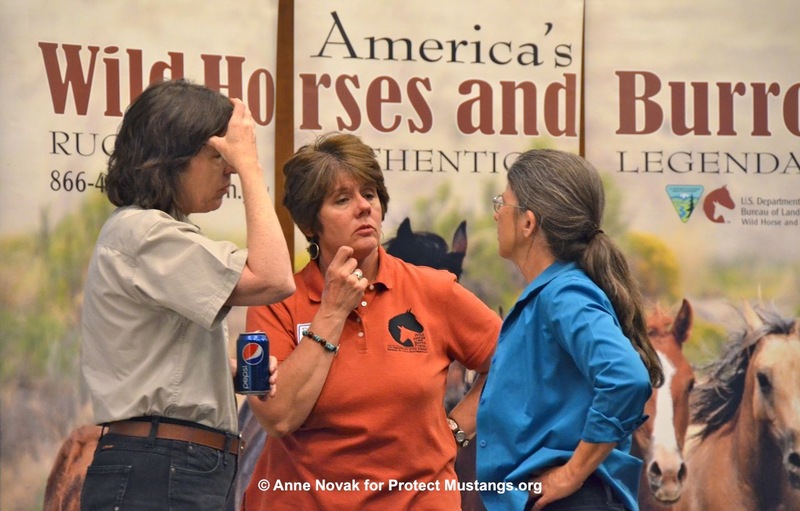 When asked questions about the number of uncounted dead wild horses, the BLM’s vet appeared evasive and appeared to demonstrate a blatant lack of transparency to the taxpayer. He seemed to show disrespect for his oath as a DVM by appearing to hide information about all the dead horses at the government facility. The BLM and/or their vet appear to have neglected to perform necropsies to prove exposure to triple digit heat–without shade–contributed to the death of more than 3 wild horses during the heat wave. Without necropies, there is a lack of scientific proof–even though the BLM’s negligence points to subterfuge. Keep in mind, the BLM is routinely skewing the death count by not counting the dead without brands showing their id numbers. The BLM’s mortality statistics avoid counting the majority of captured dead horses and burros. False mortality statistics are reported to convince Congress things “aren’t so bad”. We request accurate death counts for transparency. Congress and the greater public need to know the truth. Every day the BLM refuses to bring emergency shade and shelter, more people learn about the horrible way America’s captive wild horses are being treated by the agency charged to protect them. Research on shade for wild horses and burros would be a waste of taxpayer funding as food shelter, water and veterinary care are the basics for animal welfare. More roundups are inexcusable when the BLM neglects their basic care in captivity. Protect Mustangs formally reinstates our request for captive wild horses and burros to have access to shade and shelter from the elements. This shameful issue is being well documented by many advocates. 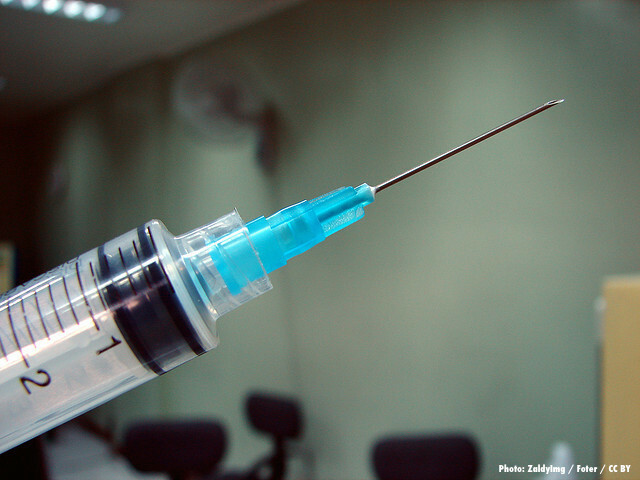 The bad science allegedly pushed by consultants is being well documented. The BLM’s lack of transparency and avoidance to work with the public is being well documented and the whole world is watching their heinous acts of neglect towards native wild horses and burros. Now contact your senators and representative and request they intervene to bring shade/shelter to the captive wild horses and burros. is the failure to provide proper shelter, food, or water. Neglect may also include failure to provide veterinary care to a horse that is ill or injured. includes the intentional act, omission, or neglect whereby unnecessary or unjustifiable physical pain or suffering is caused or permitted.Examples include poking with a sharp stick or excessively beating, intentionally scaring, or poisoning a horse. Did the Ph.D.s see the real deal? The four professionals who prepared the report, each of whom is an academia-based equine veterinarian or equine specialist, are Camie Heleski, Ph.D., from Michigan State University; Betsy Greene, Ph.D., from the University of Vermont; Sarah Ralston, VMD, Ph.D., from Rutgers University; and Carolyn Stull, Ph.D., from the University of California at Davis. These four observers were selected by the Washington, D.C.-based American Horse Protection Association, whose mission is to protect and preserve wild horses and burros on U.S. public rangelands. when faced with unexpected and extraordinary circumstances (such as water toxemia at the Owyhee gather), BLM, APHIS, and contractor personnel demonstrated the ability to review, assess, and adapt procedures to ensure the care and well being of the animals to the best of their ability. The independent observers also made a number of recommendations to the BLM, which can be found in the full report posted on the BLM’s Website. The Bureau will review and respond to each recommendation. The BLM will use the observations and findings of this report as it considers development of an independent observer program as part of the agency’s ongoing effort to put the Wild Horse and Burro Program on a sustainable track.